Title :Mega Man X2 Soul Eraser perfect strategy guide book / GB COLOR Language : Japanese. This is an official book. Release Date : 2001 Total Pages : 97 pages Platform: GB COLOR Condition : USED. Very Good. No missing page. 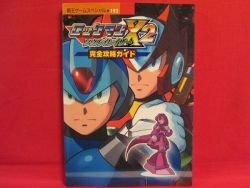 Description:This is a Japanese Videogame "Mega Man X2 Soul Eraser" strategy guide book. How to Draw Manga (Anime) Book "Comic illustrogy #1"
How to Draw Manga (Anime) Book ""Comic illustrogy #1""